We ended Wednesday with dinner and a show. I’ve always wanted to say that. It sounds so regal, doesn’t it? 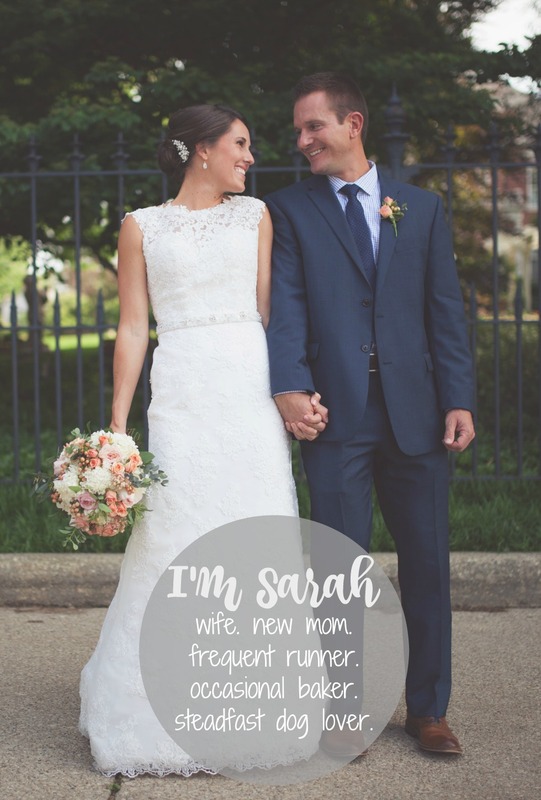 Perks of a blog. You finally get to say all the things you’ve always wanted to say without anyone telling you how silly you sound. Well at least not until I click publish. Anywho, my boyfriend bought me tickets to see Million Dollar Quartet for my birthday so we headed up to Lincoln Park yesterday evening to grab a bite before the show. Since we are Broadway regulars now (running through the theater district and seeing Jersey Boys makes us regulars, right? ), we were looking forward to a quick bite to eat and a casual show this time around. 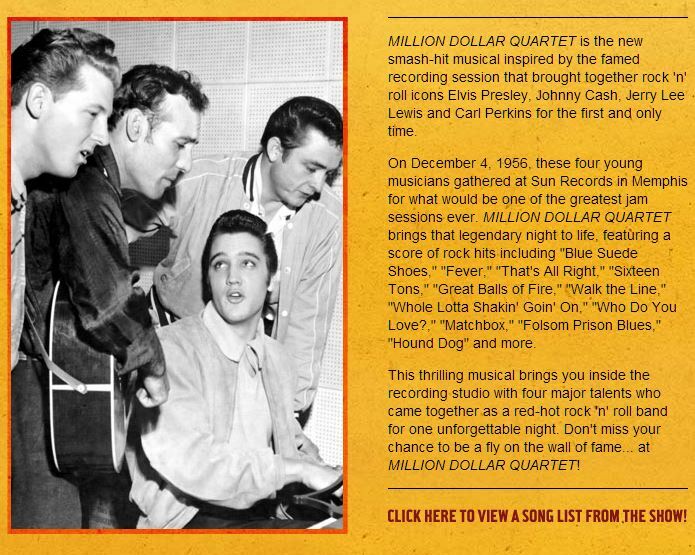 Million Dollar Quartet has been running (no pun intended) for a number of years now, in Chicago, on Broadway and throughout the U.S. I had been itching to see it since I moved to Chicago so I was pretty excited with the birthday surprise. We didn’t have a lot of time before the show so we stopped into a local spot, Etno Village Grill, for a quick dinner. I think Matt was worried that this place wouldn’t fulfill my ‘dinner and a show’ expectations but it was just what I was hoping for. Fresh menu, unique setting and fast. Most nights I don’t eat dinner until 9, but catch me on a day I don’t workout after work, and I’m ready to gnaw my arm off by 6 pm. Tell me I’m not the only one with this problem? I had the beet cured salmon BLT. Pumpernickel rye bread, avocado, lemon aoli, bacon and tomato awesomeness. It sounds weird but it was heavenly. 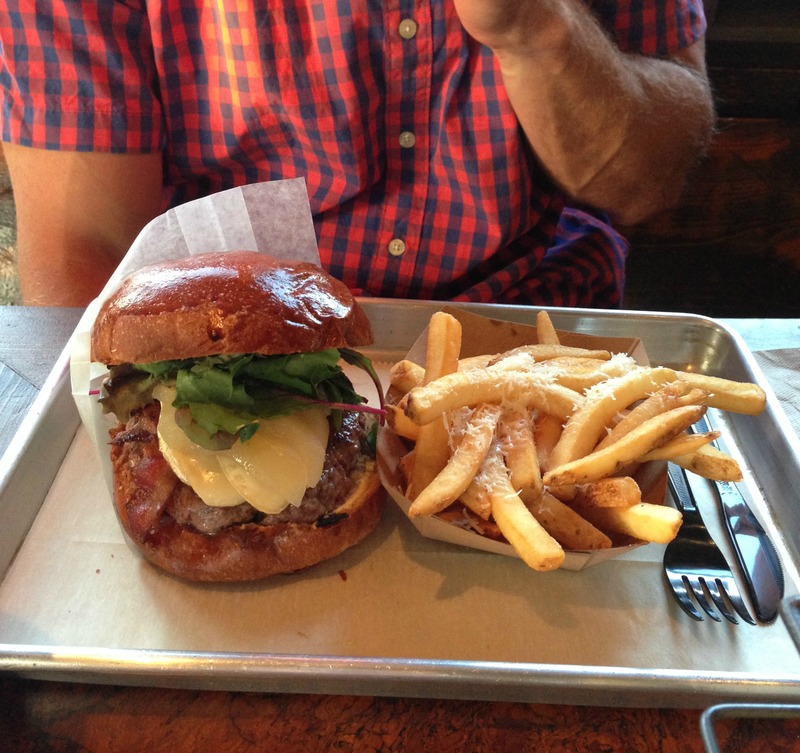 Matt had the Cason Burger with ginger-poached pear, bacon, camembert cheese and dijon on a new england bun. I should have a picture to show you but 1) I ate mine too fast and 2) I’m trying to be better about actually enjoying my food instead of instagramming it. This just in. I did manage to snap a photo of Matt’s burger. I must have blacked out while eating my salmon. Do I still get points for not instagramming mine? And yes that burger was bigger than his bicep. If you know him that’s saying a lot. After dinner, we walked next door to the Apollo Theater for the show. I was expecting a big venue but was surprised with an intimate theater. And for this show in particular, it was a perfect fit. You really felt like you were in the studio with these guys. For those of you unfamiliar with the story behind the show here’s an overview from the website. I must admit, I broke the no photography rule and snapped a photo of my playbill when we first got inside. Other than that I have no photos to show you. They really wouldn’t give you much anyway as they best part of this show is the music. If you get a chance to see it, either in Chicago or in your area, do it. And try to do it along side 100+ retirees. We didn’t realize we would be amongst a busload of them for this particular show, but I can tell you they enjoyed it just as much as we did. Goodness gracious have a great weekend. 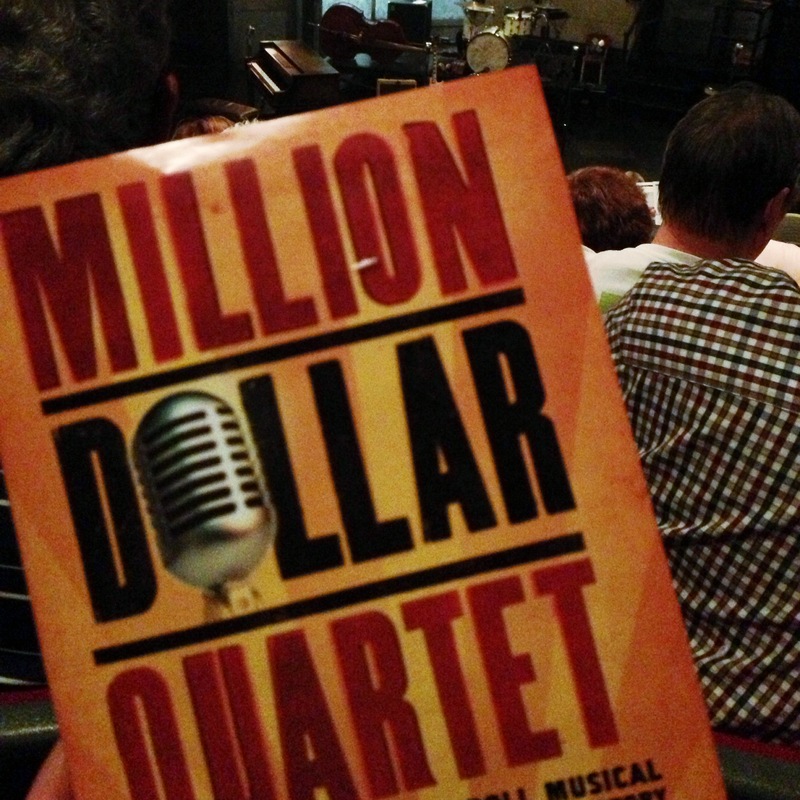 We saw Million Dollar Quartet with Jeremy’s family a few months ago!! LOVED it!!! Glad you enjoyed it, too. Were people standing up and dancing along? Thanks for the comment Jill! We had an older crowd, but nearly everyone was up on their feet by the end. Great balls of fire! Lucky girl.